Aonori is "blue seaweed" or "green seaweed", also known as green laver, is a type of edible green seaweed, including species from the genera Monostroma and Enteromorpha of Ulvaceae. It is commercially cultivated in some bay areas in Japan, such as Ise Bay. It contains rich minerals such as calcium, magnesium, lithium, vitamins, and amino acids such as methionine. 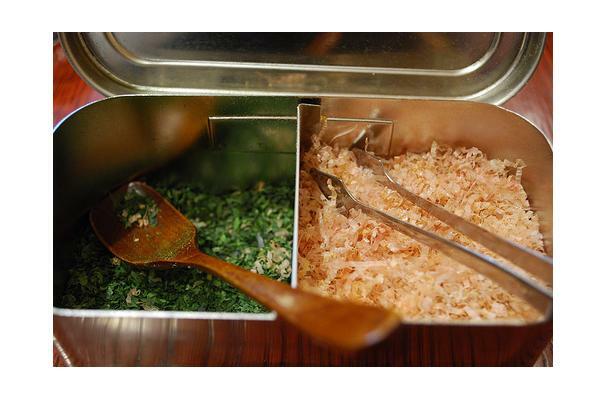 It is used in its dried form for Japanese soups, tempura, and material for manufacturing dried nori and tsukudani. It is also used in a powdered form, often blended with Ulva species of Ulvaceae as its production is limited.